In December 2017, the ship underwent upgrades throughout, and several public spaces feel refreshed and contemporary. People who have previously traveled on Nieuw Amsterdam might breathe a sigh of relief to know that the ship has now banned smoking everywhere, except the outside Sea View Bar at the ship's aft. Carpeting has been replaced throughout the ship's public areas, and even the casino smells fresh and clean. The ship lacks the flashiness or overwhelming size of some mega-cruise ships, but its unique entertainment options make up for any missing bells and whistles. For example, Nieuw Amsterdam's Music Walk creates a three-punch hit list of rich musical venues all within a short walk of each other on Deck 2. From the symphonic orchestral beauty of the Lincoln Center Stage to the soulful, dance-floor-burning hits of B.B. King's Blues Club to the sing-along atmosphere of Billboard Onboard, you're guaranteed to find something your ears will enjoy. You might notice the small details, such as the cool towels provided at the dock before you return to the ship from a day at port, the wrapped silverware in the buffet restaurant and the way crew members and even passengers in the hallway are more likely to say, "Good afternoon" or "Good evening," rather than a more informal "Hi!" The whole effect is dignified and unrushed. 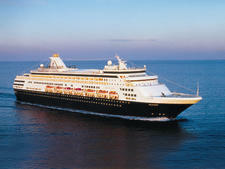 Another feature that we greatly appreciated was Holland America's Navigator, an internet-based application that allows passengers to see daily scheduled events at a glance, book dinner reservations and shore excursions, and chat with any family and friends who are traveling with you -- all without paying for internet access. Holland America's clientele skews more toward older adults, and this ship fits that profile, with retirees accounting for a large number of the population. Though there weren't many younger cruisers or families during our trip, a friendly atmosphere and ample opportunities for getting to know fellow passengers over meals or on shore excursions led us to meet many interesting people along the way. The biggest downsides of the ship were related to the number of people onboard compared to the size of the public spaces. For example, it was often very difficult to find pool chairs at either the main or the aft pools and waiting in line for meals or popular events was very much the norm. If peace and quiet is what you're seeking, the key is to find spaces of solitude wherever you can. Nieuw Amsterdam attracts a large percentage of Americans from the Upper Midwest, East Coast and Canada. The majority of the passengers are couples and retirees, and daily activities and entertainment options seem to be designed for an older clientele. You'll find few families with young children onboard, but those who are cruising tend to receive special attention and enjoy a low child-to-crew member ratio in the onboard programs and activities. Cruise Critic’s professional photographers and our extraordinary community members have taken 2,318 pictures of Holland America Nieuw Amsterdam. When you visit our photo galleries, you can be assured that what you see is what you get. On a seven-day itinerary, you can expect two formal evenings (called Gala Nights), while the rest of the nights are designated "smart casual" in the Dining Room and specialty restaurants. Jeans, shorts and tank tops are expressly discouraged, but this rule does not seem to be strictly enforced. Nevertheless, the majority of women wear dresses (similar to what you might find at a daytime wedding), while men wear button-down shirts -- occasionally paired with jackets on formal nights. A small percentage of people dressed to the nines, with one group on our sailing even donning tails and top hats. Tips for dining staff and stateroom attendants are billed to your stateroom account at $14.50 per passenger, per day for most cabins. Suite passengers will be assessed $16 per person, per day. A 15 percent service charge is also added to all drinks and spa treatments. You cannot add an additional tip for bar service, but there is a line for an additional gratuity at the spa.